Glenn Lindgren: Sometimes you just want to stop someplace where you don't have to get dressed up, the service and décor are casual, and the food is served quickly. Jorge Castillo: Glenn, you just described fast food! Glenn Lindgren: Yes, but the place I'm thinking about puts the American fast food goliaths to shame. The place is called El Rey de las Fritas (The King of the Fritas) and it is a great place to stop in for a quick lunch or dinner. Sure Miami has the same collection of fast food joints you can find in Dubuque, but if McDonald's is your idea of a great burger, you are missing out on what is either the best or the worst kept secret of Cuban cuisine. Great tasting batidos are served right to the rim. Jorge Castillo: If you are in Little Havana and stop at that place with the Golden Arches, shame on you! Glenn Lindgren: You can eat plenty of McBurgers at home. Jorge Castillo: Instead, why not try a Cuban hamburger? 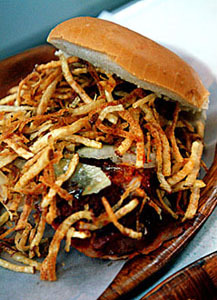 Glenn Lindgren: The Cuban hamburger, called a frita, is a delicious spiced hamburger patty cooked with plenty of secret sauce and served on a bun piled high with shoestring potatoes. Raúl Musibay: You have to try a frita and there is one place you don't want to miss. A meal on a bun. Jorge Castillo: El Rey de las Fritas makes just about the best frita in Miami. The meat is so tender and juicy, the fries are hot and crispy, and their secret sauce is out of this world! Glenn Lindgren: When we're visiting Little Havana, the only times we don't stop at El Rey de las Fritas is when they're closed. Jorge Castillo: And then we cry a lot! Glenn Lindgren: Once you've had a few fritas, don't be afraid to branch out. El Rey also makes a really outstanding pan con bistec (steak sandwich), tamales, Cuban sandwiches, and more. Jorge Castillo: This is a place that anyone can walk into and feel welcome. All of the menu items are presented in both Spanish and English with pictures. Raúl Musibay: You can't go wrong. 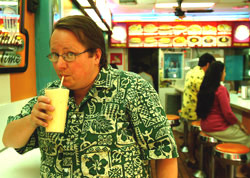 Glenn Lindgren: They even serve a perro caliente (hot dog) for the kids or adults-who-refuse-to-try-anything-new in your group. Jorge Castillo: Hey, if you do have any of those adults-who-refuse-to-try-anything-new in your group, we suggest you ditch them! will make you feel welcome! Raúl Musibay: Don't forget to order a drink. The batidos (shakes) are great. Jorge Castillo: And they have all the popular flavors mango, piña, coco, trigo  it's hard to make up your mind. Glenn Lindgren: They also serve a few simple desserts. The flan is a nice sweet way to clear your palate after overdosing on the secret sauce. 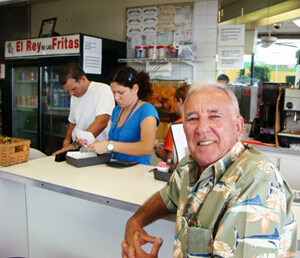 Raúl Musibay: If you can't make it to Little Havana, El Rey de las Fritas has two other convenient Miami locations. El Rey also makes a really outstanding pan con bistec  steak sandwich. The batidos (shakes) are great. 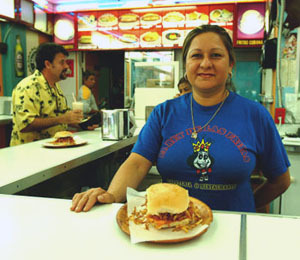 Note: Photos here are from the original location on Calle Ocho, now closed and moved up the street to 1821 SW 8th Street. A backlit menu board above the grill shows a picture of every item and the price, everything from pan con bistec to a tuna sandwich. However, here the frita is truly king and during the rush, the cook keeps the small grill covered with sizzling patties in various states of readiness. Select a stool and eat in or order "para llevar" at the cash register or walk-up window (“la ventanita”): a roving waitress will take your order. The din of a dozen conversations competes with the calling out of the orders. The scent of the heavenly patties and onions hitting the hot grill top fills the room. Whether you eat yours "straight up" or draped with a slice of decidedly American cheese, the frita seems to disappear magically from your plate. Those in the know make a dessert out of the buñuelos, impossibly light pastries with a hint of anise. 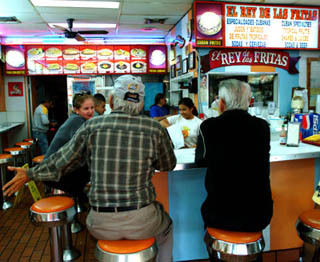 A typical crowd at El Rey de las Fritas includes both Latins and Anglos. Workers from nearby shops and service stations share the counter with a tourist or two. Miami Dade police officers are regular patrons and although few people are previously acquainted, everyone acts as though everyone else is a close friend. You might even find yourself elbow to elbow with a pregnant woman: for some reason Cuban woman crave fritas when they are with child. Pregnant or not, you will discover that a salty, spicy frita coupled with a sweet mango shake is just about as close as anyone can get to paradise. 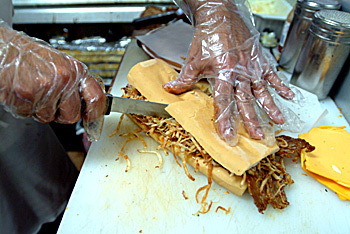 For the locals, the frita is the worst kept secret in town, as evidenced by the lines that form every day. Join the masses on a Saturday night as they worship at the altar of the perfect frita: El Rey de Las Fritas on Bird Road in Westchester. 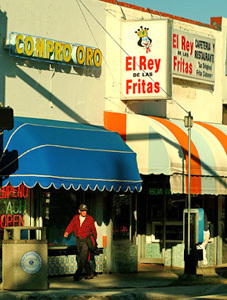 Squeezed into a corner of a strip mall and sharing space with a busy bowling alley and a store with a large sign that promises "Puppies, Puppies, Puppies," El Rey de Las Fritas is the quintessential hole-in-the-wall restaurant. If not for the crowds at lunch and early evening, the average person would probably pass right by. People come here for fritas and a refreshing Cuban batido, or milkshake. 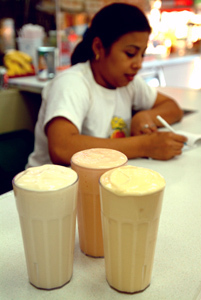 El Rey de Las Fritas makes them in several tropical fruit flavors such as mango, banana, and papaya whipped in a blender with whole milk, sugar, and crushed ice. People do not flock here for the atmosphere. This is basic diner décor, with two long metal-edged, white Formica-topped counters and a dozen bar stools. Raúl Musibay waiting for his frita at the Bird Road location.